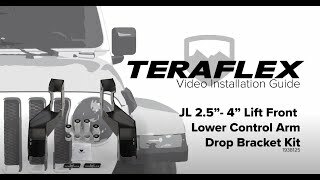 These TeraFlex JL/JLU: Front Control Arm Sport Brackets are a must to correct caster angles and restore factory geometry on JL/JLU Wrangler models with a 2.5-4.5” coil spring lift kit. Additionally, these Sport Brackets improve overall ride quality resulting in a smoother ride. Simply install these bolt-on brackets with the stock front upper and front lower control arms on a 2.5-4.5” lift kits. • Available Sport Bracket HD Reinforcement Kit (# 1938115) beefs up the Front Control Arm Sport Brackets. Recommended, but not required.